GBA Castlevania: Aria of Sorrow (USA) "all souls" in 25:47.05 by Kriole. 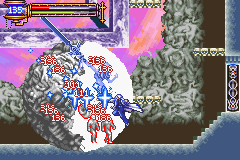 Everyone who has at least once attempted to gather a soul from each of the 120 different enemies in Aria of Sorrow, especially during a speedrun, knows the frustration it incurs after a hundredth failed attempt to get the required drop. That just makes this all-souls TAS, which beats the game on Hard mode and without using glitch warps in a little more than 25 minutes, even more impressive. Upon completing his warpless any%, Kriole decided to take another jab at this category, improving upon his earlier effort by 2 minutes and 14 seconds. However, if you would like to see the game beaten to a pulp in a mere quarter of this time, don't miss the glitched TAS by klmz. Note: while the movie doesn't use the glitch warps (neither by death nor by getting out-of-bounds using transform souls), it does use the normal warp rooms present in the castle. Note: Starting from reset was necessary to take advantage of using Hard mode; it is normally not allowed — refer to the rules to see our reasons.